Want to capture the attention of basketball fans? 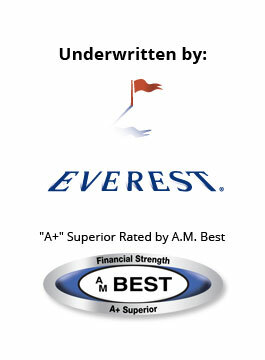 Looking to net more customers, traffic and sales this March? Market into the “fandemonium” surrounding the Men’s College Basketball Tournament with a little help from Odds On Promotions! Check out some of our most popular basketball promotions below, or give us a call today at 888-827-2249 and let us create a custom promotion for your organization. Looking for a fast, easy and rewarding way to make everyone feel like a winner during basketball season? Look no further than Scoreboard Payoff pull tab cards. Simply select any two basketball games to feature and distribute the cards prior to tip-off of the first game. Players then pull off the card’s tabs to reveal a set of numbers for both games. If the last digit of each teams’ scores match both halves of the two games, they’ll score $25,000. Match any three of four scores and the lucky card holder will win $1,000. Both prizes paid for by Odds On Promotions. Looking to attract or entertain a crowd? Keep customers on-premise and coming back for more with a little help from Odds On Promotions! On key nights during or after the tournament, give your customers the chance to "Net Big Cash" in a basketball-themed Lucky Envelopes contest. If your lucky contestant can "score" a winning number of points - or find a winning number of symbols, they'll score some serious cash, and Odds On will write the check! 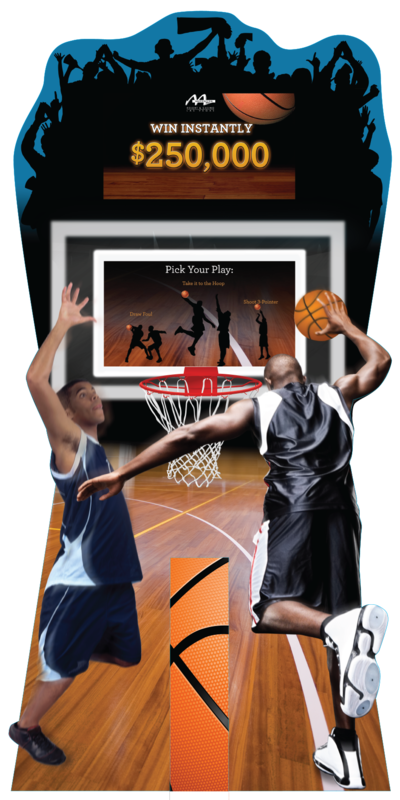 Give your patrons a chance to win cash and prizes with Pick 6, Odds On Promotions' basketball-themed Video Scratch and Win Game available on your choice of Odds On’s countertop Lite Kiosk or easy to use Handheld Tablet! 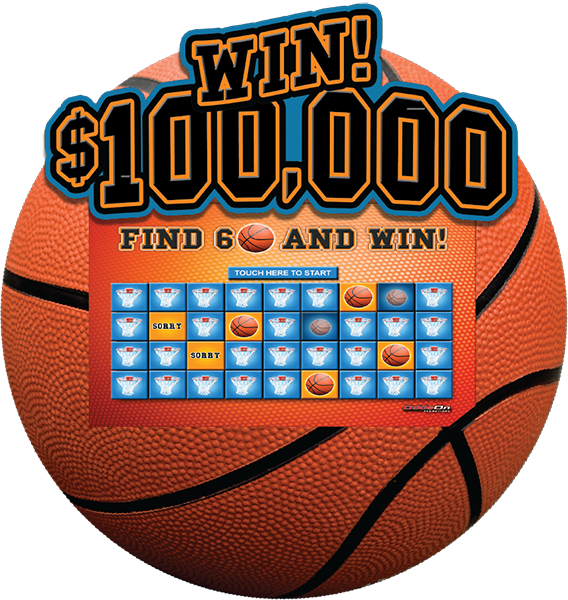 Customers simply unveil six spots on the game's touchscreen video grid, and if they unveil six grand prize symbols (basketballs, of course), they’ll win your grand prize, and Odds On will write the check! The game can also award secondary prizes for unveiling fewer winning symbols. Looking for a traffic-driver that’s also a traffic-stopper? Give your customers the chance to win mega riches this March with Odds On’s basketball-themed Hoops Hysteria Deluxe Zoom Ball. If a lucky contestant can net six orange balls in the Zoom Zone, they’ll score a ton of cash and prizes, and Odds On Promotions will pick up the tab! Give your customers the chance to shoot and score prizes with Net Big Cash, Odds On’s basketball-themed kiosk game. Designed for casinos, players simply swipe their player's club card and then select their favorite "player" on the game's touchscreen. If they can pick the player that knows how to take it downtown, they'll score up to $1,000,000, paid for by Odds On! Award consolation prizes based on theoretical win and additional plays based on points earned! Take advantage of the hoopla surrounding the Men's College Basketball tournament this year by offering your customers a shot at winning up to $1,000,000 for correctly predicting a select number of the tournament game winners with a custom online Championship Challenge basketball bracket contest from Odds On Promotions. And don't worry, when a lucky contestant picks them all right, we'll be there to pay the prize! 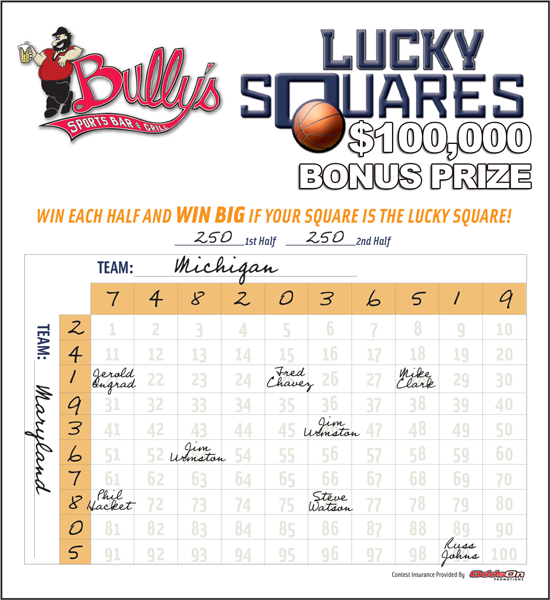 Add the excitement of oversized prizes to your basketball pool with Lucky Squares. We’ll send you a custom basketball pool grid with a mystery square worth up to $50,000 or more! If the final score of the big game falls on the preselected square, the owner of that square wins the giant prize – paid for by Odds On!